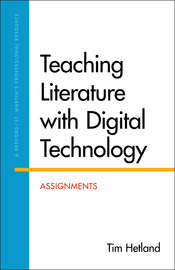 Teaching Literature with Digital Technology is a collection of digital assignments, each created by a contributor in the fields of literature and composition. Edited by Seattle-based scholar and teacher Tim Hetland and available as a print text or PDF e-book, this resource for instructors invites students to become knowledge-makers as it introduces creative uses of social media, digital tools, podcasts, multimodal assignments, and digital archives to learn about literature. Sample assignments can be viewed in the Professional Resources folder on the Macmillan English Community site. To order the print text, use ISBN: 978-1-4576-2948-8; to order a PDF e-book of the text, use ISBN: 978-1-3190-7643-6.